Black and white are the ultimate in chic and sophisticated décor. 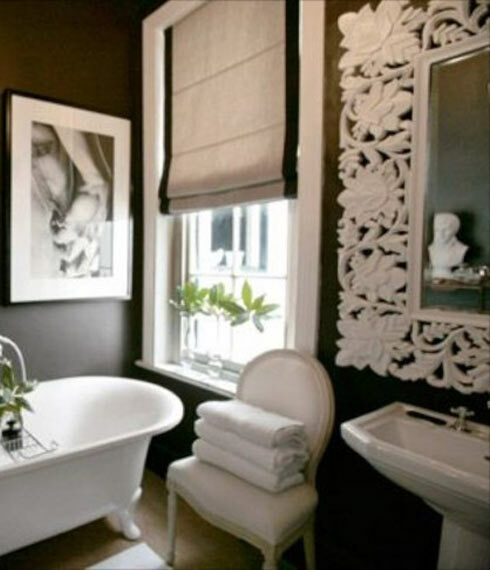 With an intense black backdrop, the white accents throughout this bathroom practically pop off the walls. This white Roman shade with its black side stripe is the perfect combination of simple and elegant and fits the room to a T.
This custom Roman shade combines the elegance of a soft drapery with the functionality of a roller shade. Mounted at the ceiling line, these beautiful and timeless window treatments draw the eye up and around the room. Choose the perfect hue to accent the color and feel of your décor. 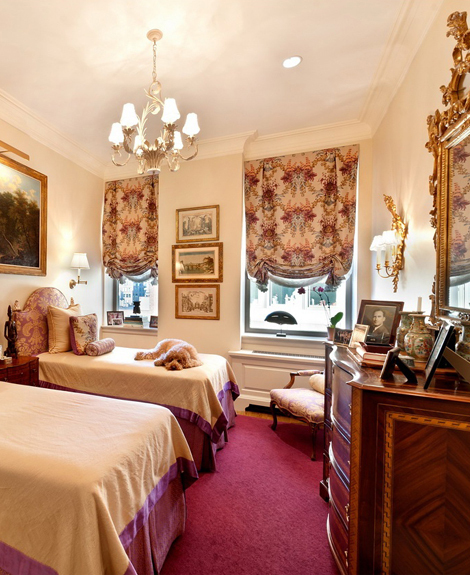 Custom designed Roman shades create the perfect vision for your guest bedroom. Even with a bold pattern and color, these shades are soft and luxurious looking and don't overwhelm the rest of the room's décor. 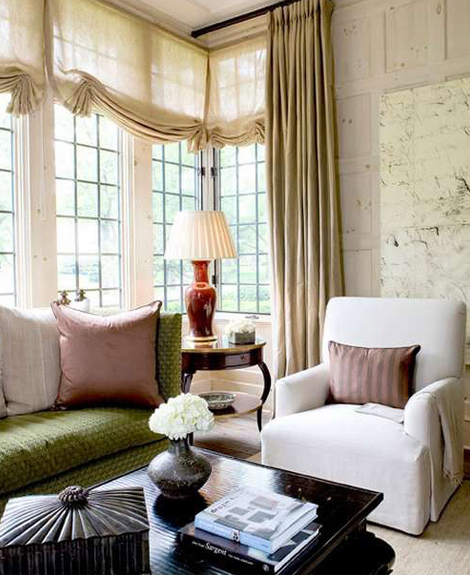 Get plenty of extra fabric for matching throw pillows and chair upholstery for a coordinated look. Gaze out the grandiose windows while standing at your sink in this bright and fresh kitchen. 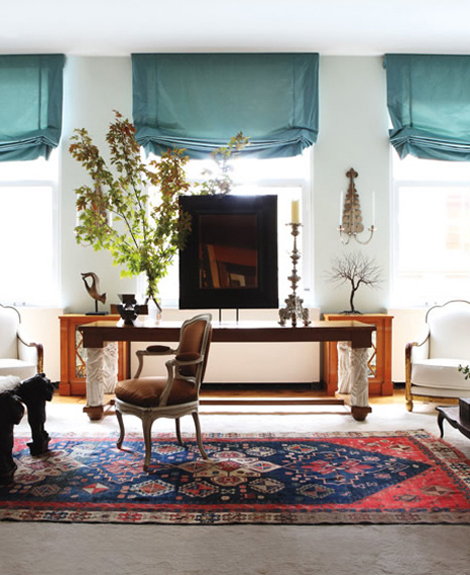 These sheer and elegant Roman shades will never block your view whether they are completely open or closed. Keep the look monochromatic and classic or coordinate with multiple colors and accessories to liven up the space. 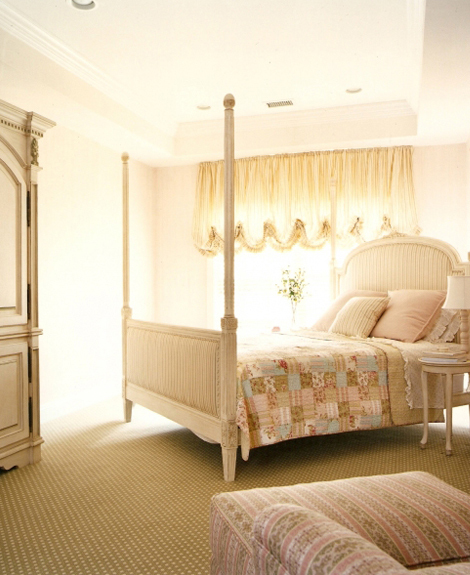 Give your bedroom a timeless, feminine feel with this luxurious Roman shade. The fabric pattern on this custom shade is subtle yet classic and coordinates well with the other textiles throughout the room. In order to keep the pink accents more sophisticated than “girly”, pair it with warm beige carpeting, a multi-colored quilt, and whitewashed furniture. Give an already dramatic room an extra dash of drama with these beautiful Roman shades mounted high along the ceiling line. Matching floor length pinch pleated drapery panels complete the sophisticated look. 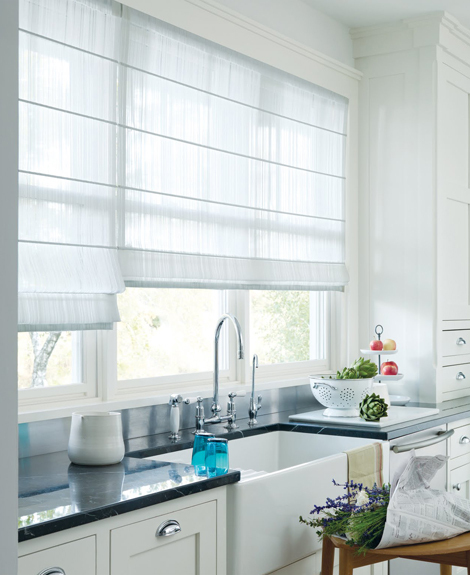 These Roman shades have fabric sheer enough to allow natural light to shine through while still offering a sense of privacy. 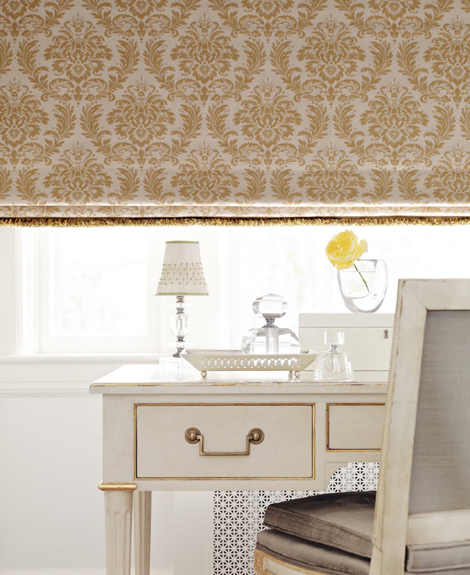 This office space is brought to a new level of elegance with a beautiful Roman shade. The brocade textile is heavy enough to completely block out the sunlight while the classic pattern is sophisticated without overwhelming the room. The color perfectly matches the gold leaf highlights on the desk and crystal accents make the room sparkle. 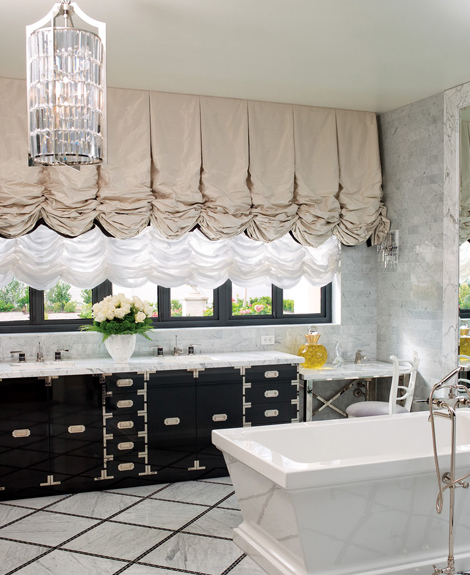 The black and white color scheme in this master bathroom is softened by both the color and style of this Roman shade layered on top of a matching Austrian shade. The graceful curves of these window treatments also complement the hard look of the floor tiles, countertop, and edges of the bathtub. 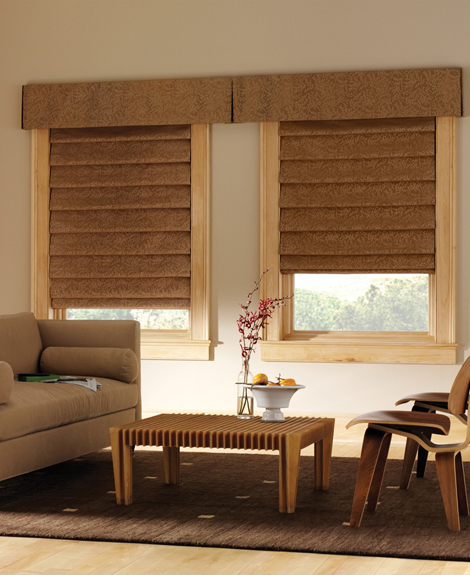 Enhance the masculine feel of your contemporary den with these subtly patterned Roman shades and matching valance. Mounted inside the frame, these shades allow the natural woodwork to show which is enhanced by the similar colored coffee table and side chairs. The soft pleats in the shade keep the room from feeling too stark.